The following is a press release issued by Chord Electronics. May 9, 2018 | Buffalo, NY: Bluebird Music today announced immediate availability of the new Qutest DAC from England's Chord Electronics. The Qutest is a replacement of the popular 2Qute DAC. Qutest uses the same award-winning internal DAC architecture and proprietary software coding as the new Hugo 2, giving it proven class-leading technical and sonic performance. Chord's latest FPGA and advanced WTA (Watts Transient Aligned) filters have been implemented in the Qutest, bringing a wide variety of performance improvements over the 2Qute in a number of areas. Performance gains have been made in timing accuracy, noise reduction and dynamic range and tap length, the technical indicator of how complex the interpolation filter is, has more than doubled compared to its predecessor, to 49,152. As with Hugo 2, the Qutest has a new filter switch which allows users to adjust the frequency-shaping to suit their listening preferences or to achieve ideal synergy with their existing components. There are four levels of filtering from warm and soft to transparent and incisive. 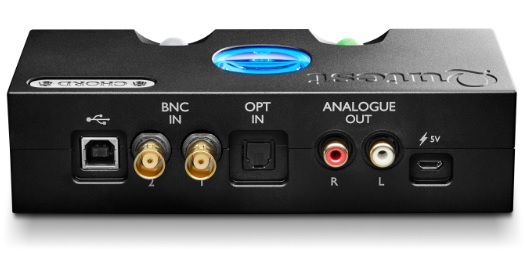 Qutest features a galvanically isolated USB-B, optical and dual coaxial digital inputs, giving an instant upgrade to everyday audio devices plus the ability to modernize ageing digital source components. It also features RCA analog outputs for connection to integrated amplifiers, preamps and headphone amps. The Qutest chassis is all-new too. It has significantly greater mass than its predecessor and has been precision-machined from solid aircraft-grade aluminum billet. The Qutest PCB nestles within a shallow cavity in the chassis, giving the circuit board greater protection within the casework and additional isolation from external vibration compared to previous designs. Qutest is available in black only and in stock now for immediate delivery. Qutest retails for $1,895 US or $2,349 Canadian.